Description: The standard F. macrodiscus is a medium sized barrel cactus with a flat, solitary stem up to 30 cm of diameter (but up to nearly 60 in some cases) and with a blue-green epidermis. The monstrous form is a genetically stable mutation with variable, irregularly shaped ribs with tiny raised, tubercle-like, knobby-looking swellings along the stems. It is very different and forms large low clusters of rubbery-textured cristated shapes only a few centimetres across. The plant looks more like a strange green "rock" than a cactus. Rarely a spine or a hair reveal it true nature. 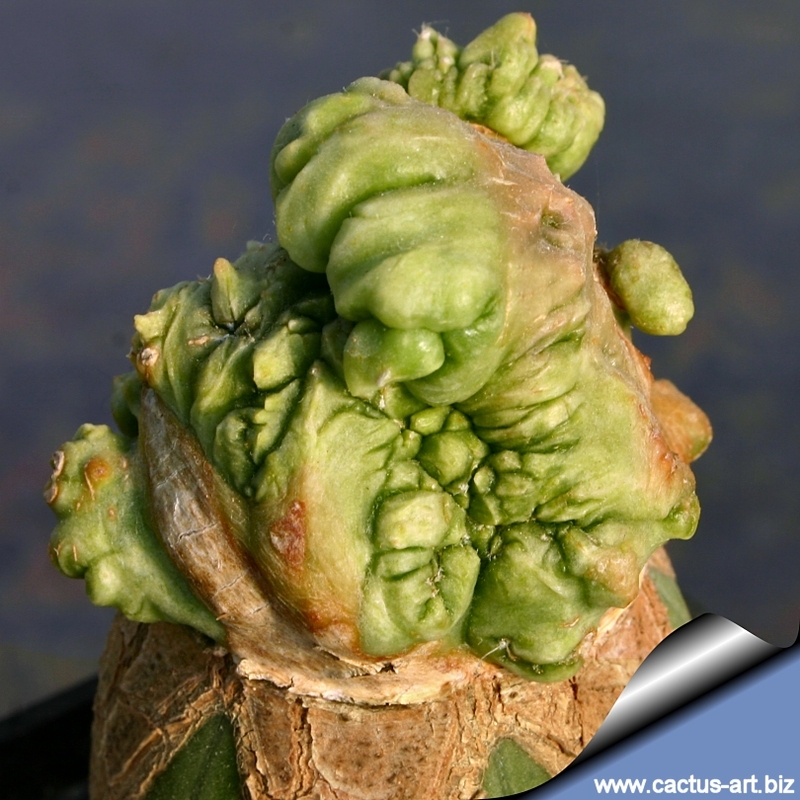 This cultivar shows many growing variations, with different crested and monstrous shapes. It is very rare and seldom seen only in specialized collections. Cultivation: It is very slow growing but does well under cultivation. Suited for any rich, well drained soil (Ph 6). Grow it in full sun throughout the year. In winter keep completely dry at 10°C, but it can tolerate sporadic light frost. Anyhow it's problematic if the temperature goes below 5° with high humidity during the winter rest. Even adult specimens are affected by wounded spots in their epidermis. It takes less watering than the standard for other ferocacti. It's necessary to be avoid wetting the bodies of these plants while they are in sunlight. A wet cactus in the sun light can cause sun burning, which can lead to scars, or even fungal infections and death. It is apt to undergo attacks of red spiders if it is placed near fruit trees. Propagation: F. macrodiscus f. mostruosa does not apparently flower or seed. 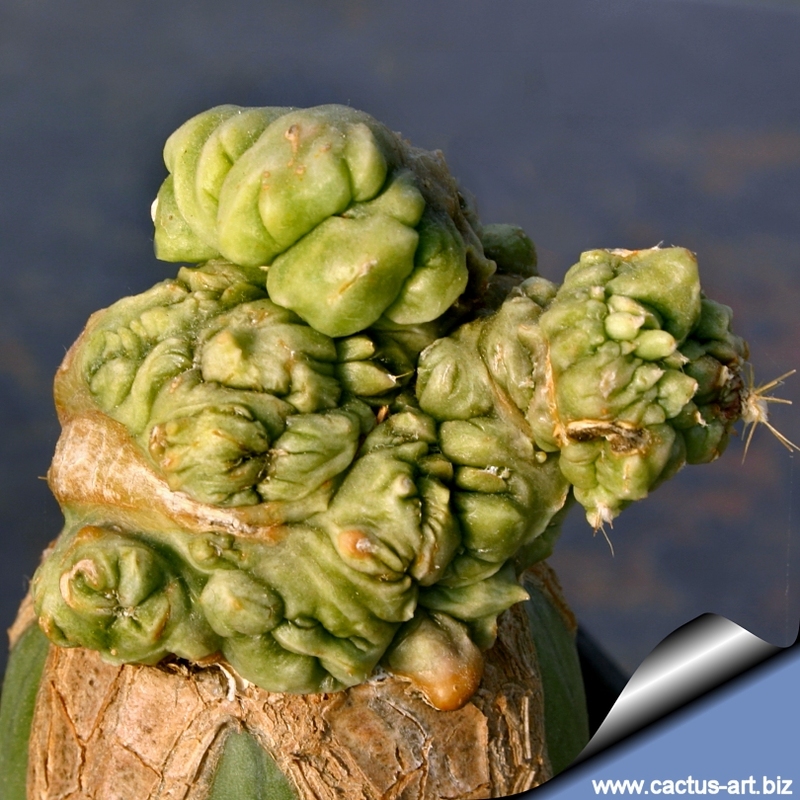 All specimens in cultivation must at one time have been propagated vegetatively. This plant is almost always propagated by cutting but some reports that it can be also increased by cuttings, which will take root in a minimum temperature of 20° C. Cuttings of healthy shoots can be taken in the spring and summer, Cut the stem with a sharp, sterile knife just above a bud or shoot (a 7-10cm long tip or branch is most suitable for propagation). Leave the cutting in a warm, dry place for a week or weeks (depending on how thick the cutting is) until a callus forms over the wound. 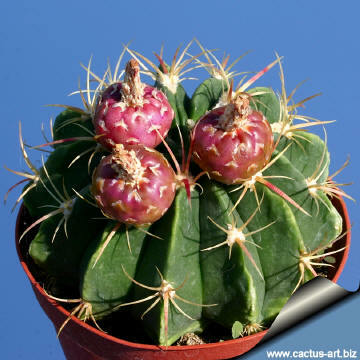 Once the callus forms, the cutting may be inserted in a container filled with firmed cactus potting mix topped with a surface layer of coarse grit. They should be placed in the coarse grit only; this prevents the cut end from becoming too wet and allows the roots to penetrate the rich compost underneath. The cuttings should root in 2 to 6 weeks. Photo of conspecific taxa, varieties, forms and cultivars of Ferocactus macrodiscus.